Myanmar opposition leader Aung San Suu Kyi and an American man who swam to her lakeside home went on trial Monday behind closed doors inside a prison compound. The trial is expected to last about three months, said Nyan Win, spokesman for her National League for Democracy party. Suu Kyi’s lawyer asked the court to open up the hearings but was turned down because of security concerns, Win said. Police put up roadblocks on the streets leading to the Insean Prison near Yangon, with a half-dozen officers at each station. A group of diplomats from Germany, Italy, Australia and Britain tried to pass through the barricades to attend the trial. They were stopped and turned away. About 100 supporters of Suu Kyi waited outside. The American visitor, John Yettaw, is charged with immigration violations and trespassing into a restrictive area, charges that carry a maximum sentence of five years in prison. He is accused of staying overnight in Suu Kyi’s lakeside home earlier this month, violating the conditions of her house arrest, according to the country’s ruling military junta, which rarely grants her visitors. The central Missouri man was appointed a lawyer selected by the U.S. embassy, Win said. Suu Kyi, the 1991 Nobel Peace Prize laureate, and two of her maids have been detained under Section 22 of the country’s legal code — a law against subversion — according to Nyan Win, spokesman for Suu Kyi’s National League for Democracy. 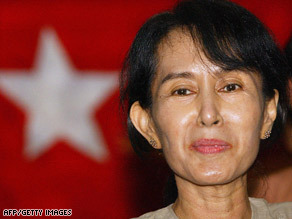 Suu Kyi, 63, had been scheduled to be released from house arrest later this month after being incarcerated 13 of the past 19 years. She is now being held in a specially built area of Insein Prison, where Yettaw also is detained, a U.S. Embassy official told CNN on Friday. The timing of Suu Kyi’s detention raised suspicion among her supporters, who said the government’s action was an excuse to extend her house arrest. Watch former U.S. president Jimmy Carter discuss Aung San Suu Kyi » “This is the cunning plan of the regime to put Daw Aung San Suu Kyi in continuous detention beyond the six years allowed by the law they used to justify the detention of her,” said the U.S. Campaign for Burma, a pro-democracy group fighting for her release. “Daw” is an honorific. Suu Kyi has been the face of Myanmar’s pro-democracy movement and the focus of a global campaign to free her. Her National League for Democracy party won over 80 percent of the legislative seats in 1990, but she was disqualified from serving because of her house arrest, and the military junta ignored the results. It was during her house arrest that she won the Nobel Peace Prize in 1991.